Mr. Phil Kent a native of Scottsville, Kentucky and a graduate from Allen County-Scottsville High School. He is a graduate of Western Kentucky University receiving a Bachelors degree in Instrumental Music Education, K-12. He has earned a Masters in Music Education with a string emphasis from VanderCook College of Music in Chicago, Illinois. He studied both trombone with Dale Warren and violin with Stanislov Antoniovich, then upon completion of his degree began studying cello..
Mr. Kent is currently in his fifteenth year of teaching has an orchestra director. He is in his eighth year as the director of orchestras at Lafayette High School, the School for the Performing and Creative Arts, and Picadome Elementary in Lexington, KY. Previously, he taught in the Montgomery County School System in Mount Sterling, Kentucky..
Mr. Kent served as the KMEA District 8 Orchestra Chair, the Kentucky Music Educators Association State Orchestra Chair, and KMEA Credentials and Elections Chair. He has also served as an adjudicator for KMEA Large Ensemble Assessments and KMEA Solo and Ensemble Assessments. Mr. Kent has also been invited to conduct the Jefferson County Regional Middle School Symphonic Orchestra, Campbellsville University Honors Orchestra, and the KMEA Third District Honors Orchestra. He has performed with various professional and community ensembles such as the Woodford County Community Theater, the Kentucky Conservatory Theater Group, the Bluegrass Area Jazz Ambassadors, and the Yellow Dog New Orleans Jazz Band. Mr. Kent is a member of the Kentucky Music Educators Association, the Music Educators National Conference, Phi Mu Alpha, and the American String Teachers Association. Mr. Phil Kent is married to his beautiful bride Amanda Kent and enjoy hiking, camping, and traveling. They live in Lexington with their two furry children Zara and Miles. Mrs. Laura Holbrook graduated from the University of Kentucky with a Bachelors in Music Education in 2011 where she studied violin with Mrs. Margaret Karp. 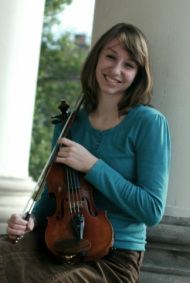 While studying Music Education at UK, she performed in venues such as the Lincoln Center and Carnegie Hall with artists including Arlo Guthrie, Gil Shaham, Marvin Hamlisch, and Itzhak Perlman. Mrs. Holbrook was also an active teacher in the UK String Project. This summer she completed her Master's in Music Education at the University of Kentucky. Before becoming the Associate Director of Orchestras at Lafayette High School, Mrs. Holbrook was the Clark County Orchestra Director for grades 6-12 for two years. String Education became one of her passions when she began teaching private students as a sophomore in High School. Mrs. Holbrook serves as the Tri-M Chapter Advisor and coordinator for Gig Group and SCAPA Stings. Outside of school, Mrs. Holbrook enjoys spending time with her newlywed husband, family, and church.